Today was the Winter Soltice; the longest night of the year and the official beginning of winter. 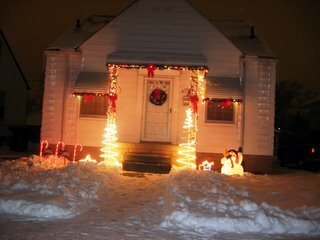 It only seemed appropriate to use this much darkness to check out some of the Christmas lights in Warrendale. 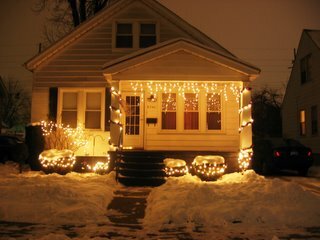 The displays ranged from very simple - a strand of lights around a living room window, for example - to downright amazing. 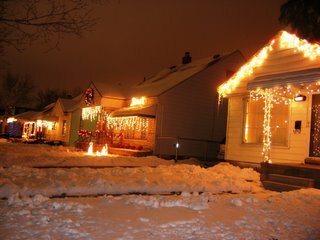 The majority of houses didn't have anything up at all. 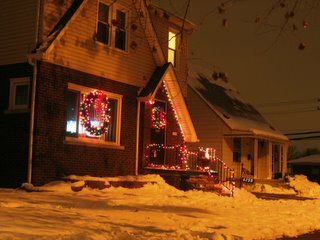 I'm not sure if that means that folks simply aren't in the holiday mood - or if they were just intimidated by the potential utility bill. Regardless, I loved those moments when there was a whole row of decorated houses. hey great pictures! Keep up the good work! Hey those are some wonderful warrendale winter wonderland pics. Nice comments on Warrendale, pictures too. Unfortunately the Warrendale we loved and lived in is gone, not to return. It is now only bare remnants of once a safe and nice place to raise kids. Now you will hear about the GOOD things from people who lived there or maybe someday in history books. -Star is there and thriving. Very good. -Many other family owned businesses that were staples in the neighborhood. Not to return.